Optical Bonding is a process that seals a top cover glass or touch screen directly to the face of the LCD display. There are two types of optical bonding: dry bonding and wet bonding. We use a wet bonding process called AOT and will only focus on that technology. 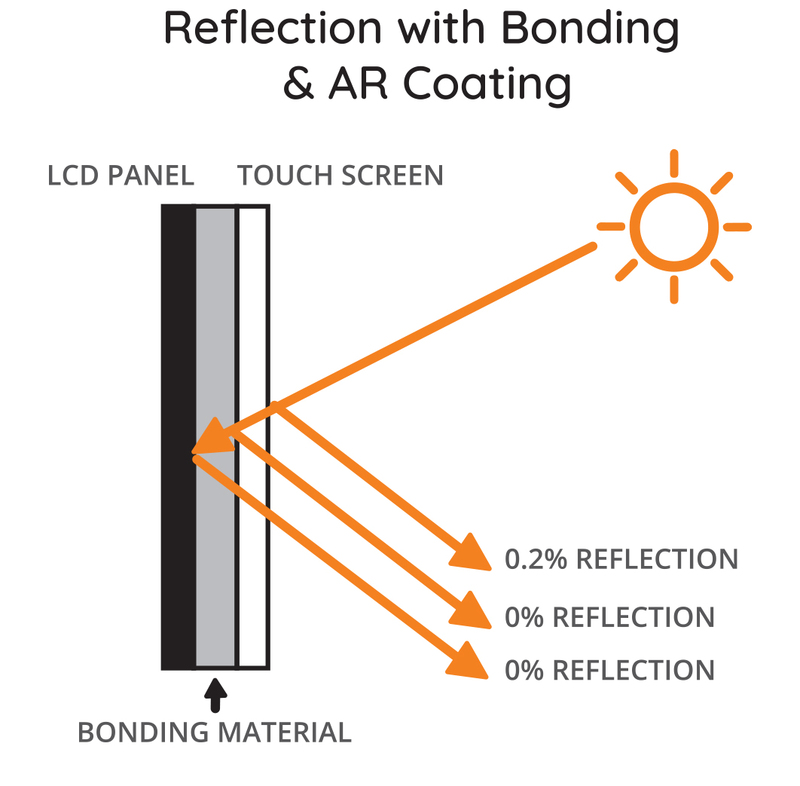 Our AOT bonding process uses a “light indexed” silicon formula to fill in the air-gap space between the LCD display and the glass / touch screen top surface. This internal bond has the effect of eliminating the refractive surfaces of the backside of the glass / touch screen as well as the front side of the LCD panel as shown in Fig. 3. When utilized in conjunction with the anti-reflective top coat technology, the 8% reflections shown in Fig. 2 can be almost eliminated resulting in excellent picture quality. One must view the impact AOT bonding has on picture quality in direct sunlight to truly appreciate it, but Fig. 4 below is a pretty accurate representation. AOT bonding enhances the structural integrity of the LCD assembly by absorbing shock to the front surface and exhibiting similar characteristics to safety glass if the front surface is damaged. AOT bonding eliminates the possibility of condensation (fogging) occurring in the air gap in high humidity environments. AOT bonding acts as a “heat sink” by pulling heat that would normally get trapped in the air gap to the front surface of the display where it can dissipate into the outside air. In summary, every raw LCD panel has its own unique character and properties and no “one size fits all” solution will work for transforming a regular panel into a high bright display. To ensure the highest quality of sunlight viewing ability, we employ a fully customized “high bright recipe” with the right mix of LED backlights, backlight driver, diffuser films, polarizers, color enhancement films, and anti-reflective treatments (such as optical bonding) to manufacture our products. Producing displays this way is an expensive and time-consuming process requiring an extensive R&D investment as well as sophisticated testing equipment. The result, however, is a truly exceptional display that our customers appreciate. We believe your customers will too.